Whether you’re planning an intimate lunch with just your nearest and dearest or a grand affair catering for the whole extended family, Christmas is one of the most special - not to mention meticulously-planned - dining occasions of the year and the perfect time to find the ultimate antique dining tables. If you’re the type who likes to turn home entertaining into an art form, you’ll have no doubt carefully thought through and coordinated every element of your meal – from the menu and accompanying wines through to the crockery, cutlery and table centrepiece. But why stop there? Here at Wallrocks we believe the dining table is one of the key centrepieces of the home and should be selected carefully and with quality, design and longevity in mind – and we think Christmas lunch is the perfect justification for a new dining setting. Click on any of the images below to view the table in detail. Here’s a little inspiration to get you in the festive spirit! Imagine serving your Christmas turkey with all the trimmings on this 19th Century French provincial farmhouse table, made from beautifully figured, high quality elm. Ideally suited to a more rustic interior style, this table comfortably seats eight and is paired here with a set of 19th Century French Louis XV walnut dining chairs. 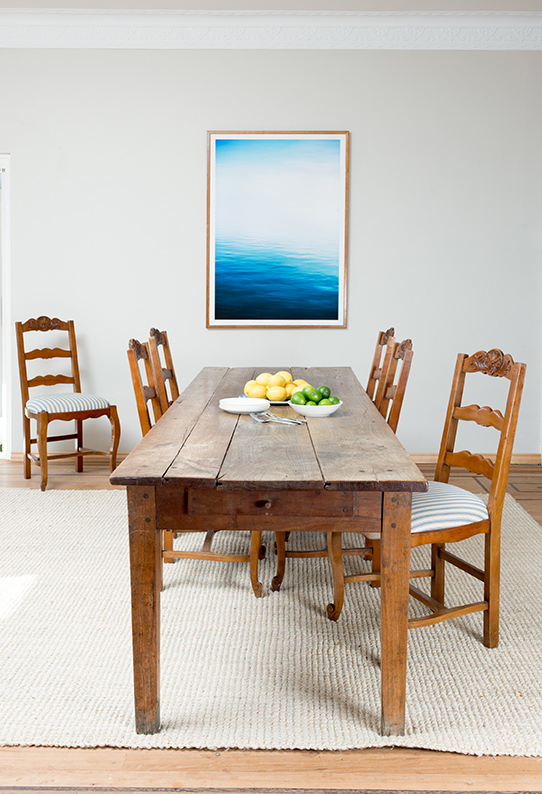 The table could look just as good with a set of Swedish dining chairs or high-backed oak french provincial ones. We love the feeling of warmth and conviviality this table creates – made for long, lazy lunches where the wine and laughs flow freely. A circular table is perfect for creating a feeling of intimacy and what better way to acieve this tyhan with this 19th century English rosewood centre table attributed to Lenehan. Perfect for hosting smaller groups, this piece will bring a touch of drama to any dining room – especially when paired with a dramatic centrepiece like this 19th Century French Louis XVI crystal and ormolu chandelier. 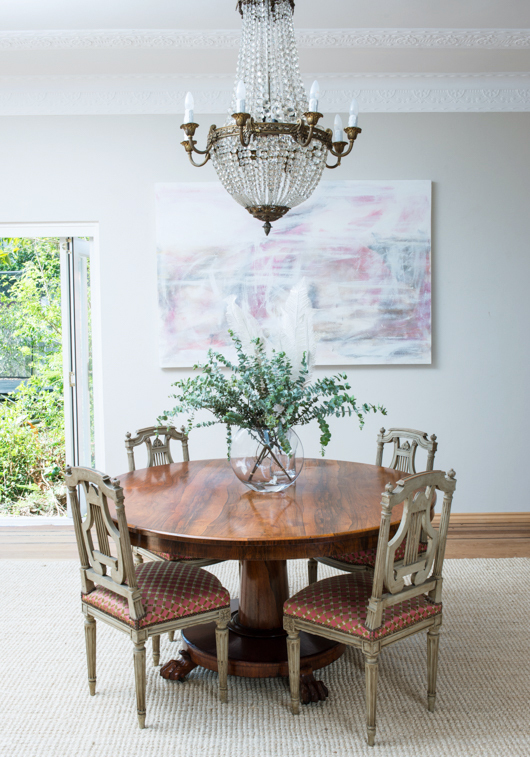 A set of six French Louis XVI decorated dining chairs and contemporary artwork complete this elegant look. 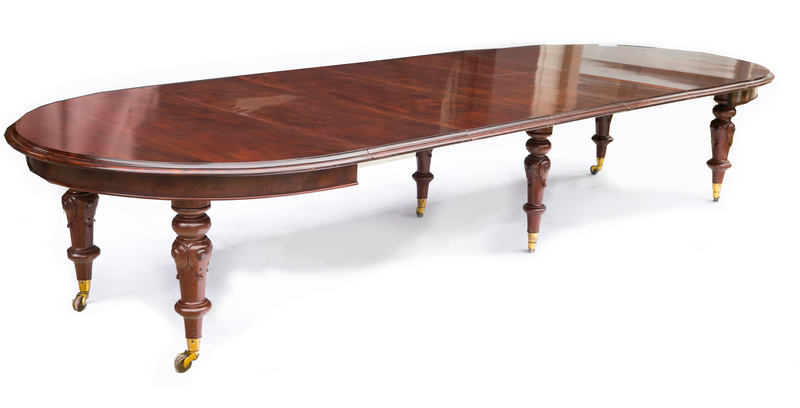 This 19th Century English table in rich, glossy walnut, is another superb example of a centre table. Or, if you have a larger group why not select one that extends according to the group size you have like this exceptional 19th century English Regency, solid mahogany antique dining tables. Not everyone prefers a formal sit-down dinner for Christmas lunch – especially in our warmer climate. But a non-traditional affair can be just as impressive – it’s all in the presentation. 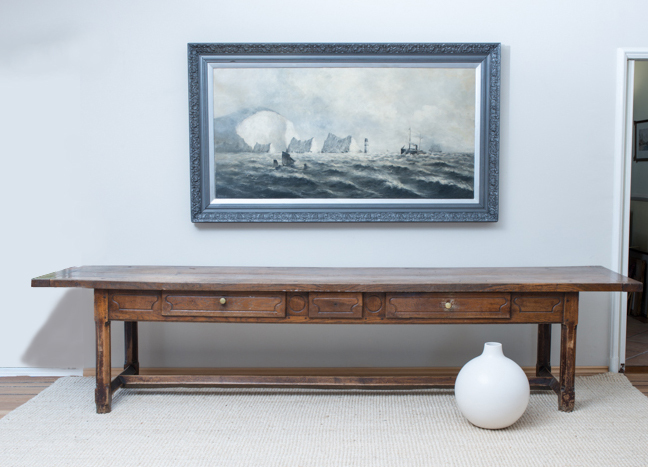 We adore this 19th century English antique oak serving table, perfect for catering to larger groups and buffet-style dining. This magnificent piece is a real show-stopper and best suited to a very large dining room, hallway or entry. Dress it with lamps, flowers and platters. 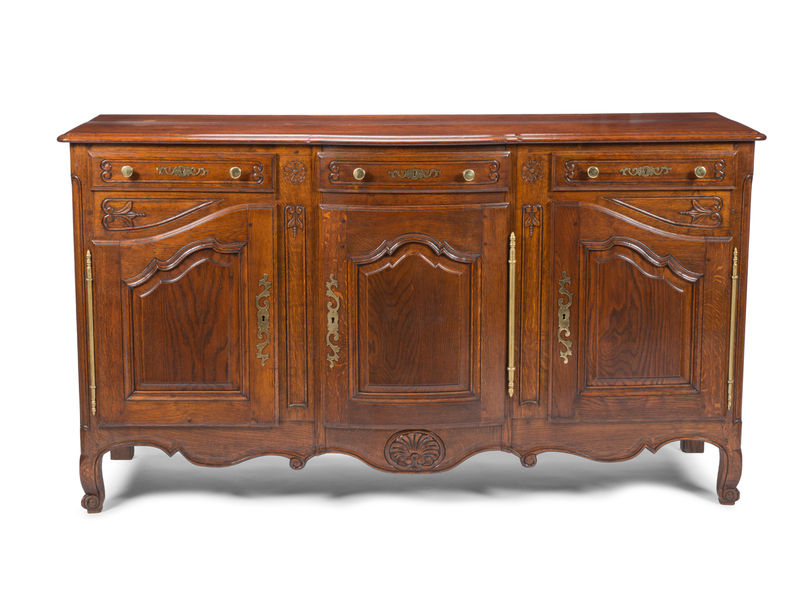 This beautifully decorated 19th century French oak side cabinet is ideal for a smaller space – place it in your dining room for storage or make it a more central feature and use it as a serving table. No dinner party is complete without a well-stocked drinks cabinet! 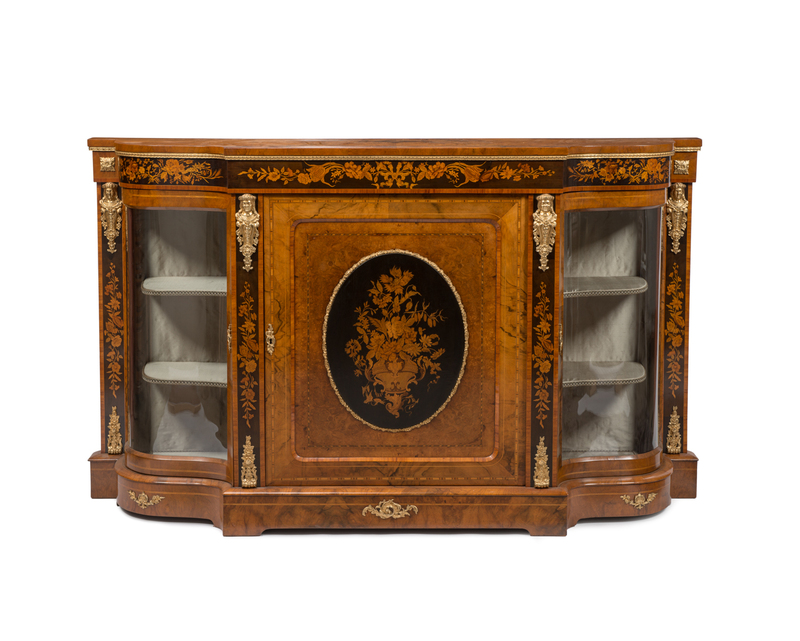 We love this beautifully-crafted 19th Century English marquetry side cabinet: use it to display your wines, spirits and champagnes or use as a serving table to minimise clutter in your main dining space.